Please check the Message Forum for news and photos of recent events, as well a for general chatter. It's your forum, and you are encouraged to participate. The class of '63 also has a web site (they did it before us). You can log in at www.classcreator.com/Bloomington-IL-1963/index.cfm. Since we are not part of their class we cannot see their locked profiles. If you wish to contact someone in the class of '63, send a message to Marvin Theobald for help. 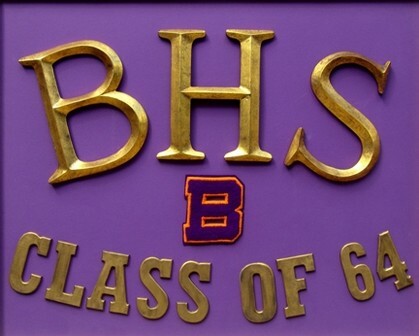 The BHS classes of '61, '62, '70, '71, '72, '75, '78, '87 and'91also have web sites. You can check these out at www.classcreator.com by hitting "Locate School" and following the prompts. Let us know what you have been up to all of these years and use your web site as means to catch up with and keep track of the many friends you had at BHS. People have changed greatly since our HS days and you may well find opportunities for new friends as well as connecting with old friends. Jump in with both feet (if you can still jump or even if you can't) and help make it a success. It is your site and it is free to you (funded by volunteers and the class treasury). Use the "Member Functions" to update your personal profile and to upload pictures. If you have difficulty select "Contact Us" and send a message. We will try to help. Help us locate missing classmates. Check the "Missing Classmates" list and "Contact Us" if you have info that might help us locate anyone.